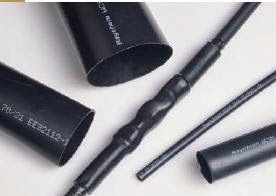 I don't mention it much here, but in addition to being Master Distributors for Covalence Heat Shrink Sleeves -- and Distributors for Denso Corrosion Prevention Products (which includes Protal 7200) -- and being distributors for Powercrete J; we are also Elite Distributors for Raychem / Tyco Electronics. Once part of the same company, Raychem Energy and Raychem Pipeline were two divisions underneath the giant (and magical) company that was Raychem Corp. As Raychem was broken apart; Raychem Pipeline and Raychem Energy ultimately ended up being owned by different companies (Raychem Pipeline now ultimately owned by Berry Plastics as a division of Seal for Life and Raychem Energy now owned by Tyco Electronics). As a result - there is a LOT of confusion about this topic, if you're interested, here is a slightly more thorough explanation of the history of Raychem Corp as a brand name. Taking a quick closer look at the pipeline side of things, none of the owners of the Raychem brand name ever did a very good job of re-branding during the name change periods....so while just about everyone in the world knows the name Raychem as a leader in the world of Pipeline Coatings; the other names we've held don't have that same 'household name' status (Berry CPG, Covalence Raychem, Tyco Adhesives, Covalence, etc). If you're looking for more information on what used to be Raychem Pipeline products - please fill out the box at the upper right of this blog - or visit the best shrink sleeve website on the planet (yes it is mine), or call us at 936/321-3333 or email me at steve@jsicoatings.com. Now, back to the topic at hand; if you're looking for Raychem Energy products (short list below) then you have successfully discovered JSI - an Elite Distributor for Raychem. I don't write about it much here; but I do have a much smaller blog dedicated to writing about Raychem Energy products and you can give that a gander if you'd like. On the electrical side of things, the purpose of the product isn't so much 'corrosion prevention' (although sealing is a large factor for many of the products); instead, these products are designed to seal, protect and offer electrical insulation. As you might expect, these products are generally designed for much smaller substrates than the pipeline products would be (with pipeline products being designed for use on pipelines 1" up through 150"). Electrical products are designed for cables, connectors, busbar, lighting wire, etc. Have questions? Contact us for questions about Raychem Pipeline Products or Raychem Energy Products - we can help!